Simply amazing to feel in September! Lillian and I are cuddling on the couch under a blanket. This picture is from a year ago. He's just so cute you almost don't want to put him to bed at night...almost. :) He's standing up in bed now though I'm not sure he realizes he can just let go and sit or lay down. So he usually ends up fussing until one of us comes to put him down again and say goodnight. Whenever I try to go in with my serious face and say goodnight and that it's time to go to sleep he just smiles and giggles up at me. Our favorite spot to sit/stand is at the top of the stadium. Since it decided to return to the 90s on Saturday (and Sunday and today), it is the best place to get a breeze. Kyle claims it's 10 degrees cooler standing up. Our little boy is not so little these days. Here he is with a red face - it was a warm one alright. More arts fest fun: Lillian getting serious with her painting, Jack happy in the stroller, Jack and Jacob watching. One of the many fun events of the fall is the Waco Arts Festival. Each year it's been something to look forward to and each year has proved itself worthy of a morning of fun. Kyle wasn't able to come since he was busy this morning with Parent's Weekend at Baylor. So Lillian, Jack and I headed off to the Festival without him but did meet up with Mary Mac and her Adam and Ryan and Katie with her Leah and Jacob. The pics are thanks to Katie because I don't have the energy to upload mine right now, and hers are so good. It really was fun and we could have easily spent all day there. These are from a week ago when we had a little family fun on Labor Day morning. The original idea was to spend a couple hours at the Waco Water Park but when we arrived at 10am we found that they didn't open until 1pm - it was the last day open. 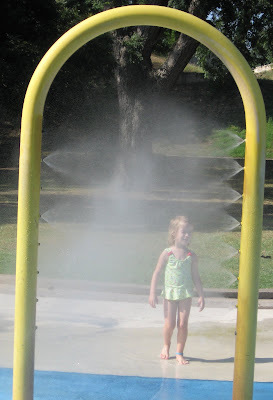 So we ventured down to Cameron Park to the spray park area and found enough excitement and wetness there. Kyle even contemplating jumping in the river right there but decided against it. I guess it wasn't cold enough to tempt him. We see you! The place looks great, wish we could visit soon. Jack and I had some time without Kyle and Lillian since they went off to run some errands. I know we are way behind in our photos with him so I decided to catch up a bit during tub time. He's definitely wiggling around and getting places these days. He sticks to the army crawl (just like Lillian did at first) but gets into enough trouble. Also, you'll see in one of the shots that he's still toothless at 10 months. In other news, we watched the Baylor Bears defeat Wake Forest 24-21. It was a fun game to watch but can't wait until they have a home game - 2 weeks. Our visits to the zoo now include the new orangutan exhibit. They are a lot of fun to watch.